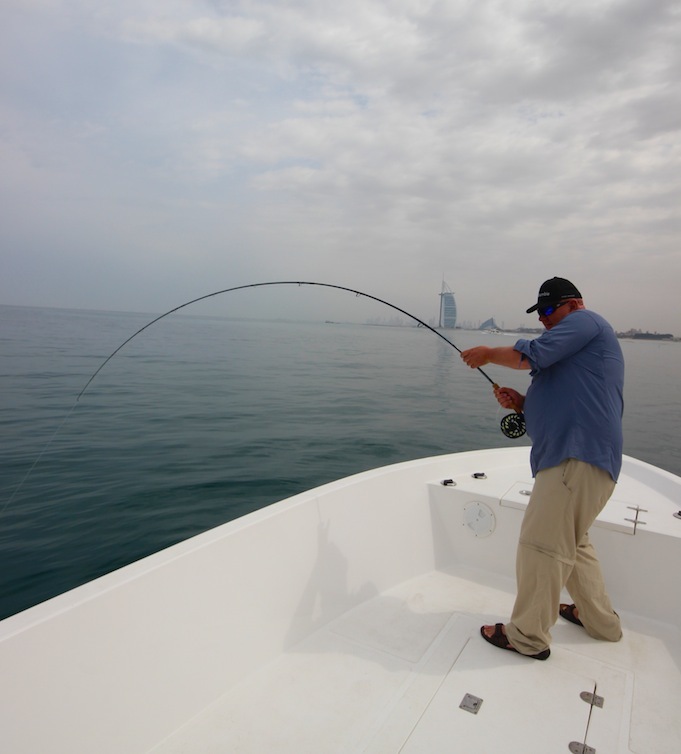 Allthough I missed the opening day on Chew ,i made up for it Fishing in Dubai whilst visiting my daughter. Many thanks go to the guys at Ocean active,for giving me one of the highlights of my flyfishing so far . Delight,frustration and "heart in mouth "is all I can describe how the morning went,as the fish were not "playing ball"at all . We tried several areas looking for baitfish and diving birds to know avail,just the odd pluck,follow ect. As we approached an area facing the Burj(as in the picture),we found bait fish and diving birds and more importantly Queens and King fish hitting hard! . This was my best chance so far.Out went an olive and white size2 clouser on a rio inter on my trusted Bloke SLP 10wt.I had several follows in the next few casts,then had a fish on that promptly spat the Hook .I was begining to think that luck was not on my side.The next cast,i actualy saw the fish take the fly and turn(the water was that clear)I strip/strike and a good fish was on 8)It took all my available flyline and into the backing,taking me on a merry dance.I gradualy got it under control and close to the boat with a couple of deep dives the fight was over.Damon the captain,tailed the fish 1st time of asking.And what a great fish it was too.A lovely queen fish finaly that was quickly photographed and safely returned.Over the moon and still shaking I cast out again.Within seconds I was hit again!This queen was bigger as we both saw it as it approached the boat.Then the hook pulled! .That was it for the morning and we returned to the marina. That looks amazing Steve. My mate Nick owns Ocean Active and I've been meaning to get out there for years. The GTs they catch are absolutely huge! Its a small world Dave .Loads of South Africans around the U.A.E. That's what the SLP was designed for, Steve! Fantastic pics and write up. Barrow Tanks will never be the same for you again! Sadly its been a while since I have had to grip the rod further up the blank like that. How heavy was that Queenfish? 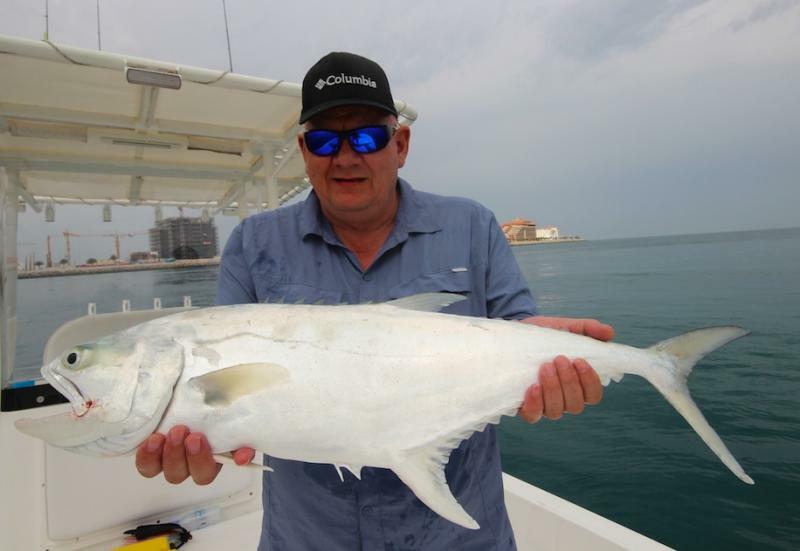 It was not weighed Alan.Catch ,release and onto the next fish. Thats a hell of a bend in your Bloke SLP Steve And a nice report to go with the trophy shots. Cheers Tony.You taught me well mate .Will make a date for a "croc" hunt soon Steve.